Todd Agnew was born in Dallas, Texas (March 15, 1971) and is a Christian musician and songwriter who has recently appeared in the Contemporary Christian market. His style of songs separate him from most mainstream Contemporary Christian singers. His best-known song to date is a version of "Amazing Grace" called "Grace Like Rain." It was featured on his first album, Grace Like Rain, release in June 2003. Since then, Agnew has released his second album, Reflection of Something, in and has introduced other popular songs like "My Jesus" and "Unchanging One", which are often featured on most Contemporary Christian stations. In late 2006, after two highly acclaimed studio projects (Grace Like Rain, Reflection of Something), he crafted an epic retelling of the Christmas story on his album entitled Do You See What I See? 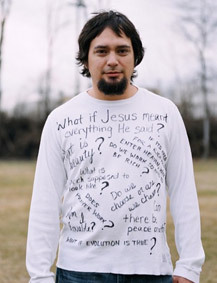 His fourth studio project, Better Questions, released in July 2007 and features the hit single “Our Great God” (a duet featuring fellow Christian artist, Rebecca St. James). Todd Agnew is also known for wearing a t-shirt, jeans, and his feet are bare on almost every album. He performs barefoot as well. Todd is also among the 12 artists selected to be a part of the Big Shiny Planet Bible Study that was recently released nationwide through LifeWay and Family Christian Stores. Using his song, "Still Has a Hold," Todd Agnew elaborates on Romans chapter seven and teaches on the subject of how regardless of your triumphs or your failures, God still has a hold of you..